General Atomics Aeronautical Systems, Inc. (GA-ASI), a leading manufacturer of Remotely Piloted Aircraft (RPA) systems, tactical radars, and electro-optic and related mission system solutions, launched a “Type-Certifiable” (STANAG 4571) version of its Predator® B product line, called SkyGuardian™, this week before an audience of international dignitaries from nine nations including the United Kingdom, Italy, France, Australia, Belgium, The Netherlands, Denmark, Norway, and the United States. SkyGuardian is the result of a five-year long company funded effort to deliver a RPA system that can operate under the stringent airworthiness requirements of non-military airspace. The aircraft leverages the legacy of the multi-mission Predator B fleet, which has amassed nearly two million flight hours. SkyGuardian can fly in excess of 35 hours with airspeeds up to 210 knots, and reach altitudes of more than 14000 meters. 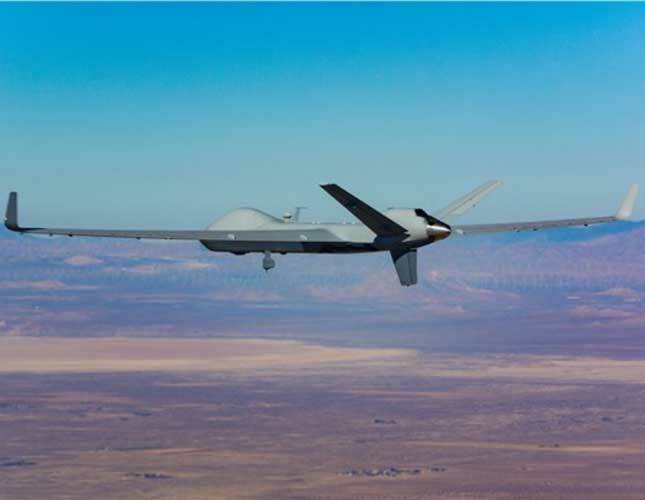 “The SkyGuardian name reflects the system’s role in protecting ground forces, as well as its performance of non-military missions like border-surveillance, maritime patrol, and relief over-watch in cases of natural disaster,” said Linden Blue, CEO GA-ASI. SkyGuardian will be fully compliant with NATO’s UAV SYSTEM AIRWORTHINESS REQUIREMENTS (defined in STANAG 4671) and the UK DEFSTAN 00-970. GA-ASI also collaborated with the LufABw (German Military Aviation Authority) to define airworthiness requirements for German Airspace. To facilitate qualification testing, GA-ASI is building three company-owned aircraft, along with two airframes designed specifically for full-scale fatigue and static testing to satisfy type-certification requirements. It plans to deliver the first production aircraft in 2018. The aircraft can host a variety of sensor and communications payloads and is capable of transmitting high-resolution video to manned aircraft and ground forces. The maritime patrol variant of this system, designated SeaGuardian™, is designed to support open ocean and littoral surface surveillance for border patrol, coast guard, and disaster relief missions. General Atomics Aeronautical Systems, Inc., an affiliate of General Atomics, delivers situational awareness by providing remotely piloted aircraft systems, radar, and electro-optic and related mission systems solutions for military and commercial applications worldwide. The company’s Aircraft Systems business unit is a leading designer and manufacturer of proven, reliable RPA systems, including Predator A, Predator B/MQ-9 Reaper® and Predator B/MQ-9 Reaper Extended Range (ER), Gray Eagle and Gray Eagle ER, Predator C Avenger® and Avenger ER, Predator XP, and SkyGuardian and SeaGuardian. It also manufactures a variety of solid-state digital Ground Control Stations (GCS), including the next-generation Advanced Cockpit GCS, and provides pilot training and support services for RPA field operations. The Mission Systems business unit designs, manufactures, and integrates the Lynx® Multi-mode Radar and sophisticated Claw® sensor control and image analysis software into both manned and remotely piloted aircraft. It also focuses on providing integrated sensor payloads and software for Intelligence, Surveillance and Reconnaissance (ISR) aircraft platforms and develops high energy lasers, electro-optic sensors, and meta-material antennas.